Can one word, picture, or extra icon make a difference in a brand's engagement? Quite simply, the answer is yes. Every component of a website or mobile app potentially can attract or repel the intended audience. From the headline's wording, color, and font size, to the use of photograph or video, and number of call-to-action buttons, too much or too little of a good thing may counter a brand's intentions. Marketers typically measure interactions: The number of times users watch and share a video, download a whitepaper, or tweet a link are only some of the many performance variables. Even when the figures are satisfying, conversion rate optimization asks "what if." By leveraging conversion rate optimization (CRO) tools, brands report tremendous gains in downloads, open rates, and overall engagement. 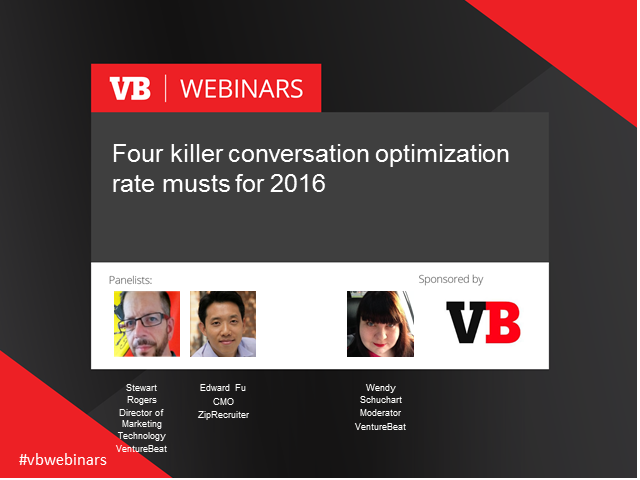 Discover how your brand can benefit from CRO by attending this VentureBeat webinar, where the CMO of ZipRecruiter will join VB Insight's own Stewart Rogers to talk about his experiences and results with conversion rate optimization. To learn more about the conversion optimization report, visit Insight.VentureBeat.com and get the latest research on the marketing technology industry.